Selecting a robust and reliable hardware platform for your high-performance development and test applications is essential; that’s why National Instruments brand of highspeed digital I/O instruments offer the most advanced interface, control, and test features necessary for today’s complex digital and mixed-signal systems. Now the test features of NI PXI/PCI-6551/6552 and PXIe-6556 HSDIO instruments have extended further— these instruments can be deployed as JTAG controllers for boundaryscan performance testing. By combining ScanExpress software tools from Corelis with recognizable National Instruments HSDIO hardware, JTAG structural and functional test capabilities become more accessible and convenient, giving you even more reason to choose NI hardware. Complete support for NI PXI/PCI/PXIe-655x HSDIO Instruments. Wide range of JTAG signal output voltage level support including 1.2V, 1.5V, 1.8V, 2.5V, 3.3V, and 5.0V. Output drive strength up to 50mA per channel. JTAG input signal protection up to 6.8V. Free-running clock with user adjustable speeds up to 30 MHz. Automatic signal delay compensation for long cable lengths between the instrument and the Unit Under Test (UUT). Ability to disable the JTAG Test Access Port when not in use. Three (3) user-controlled discrete general purpose I/O signals. Compatible with the complete ScanExpress product family. 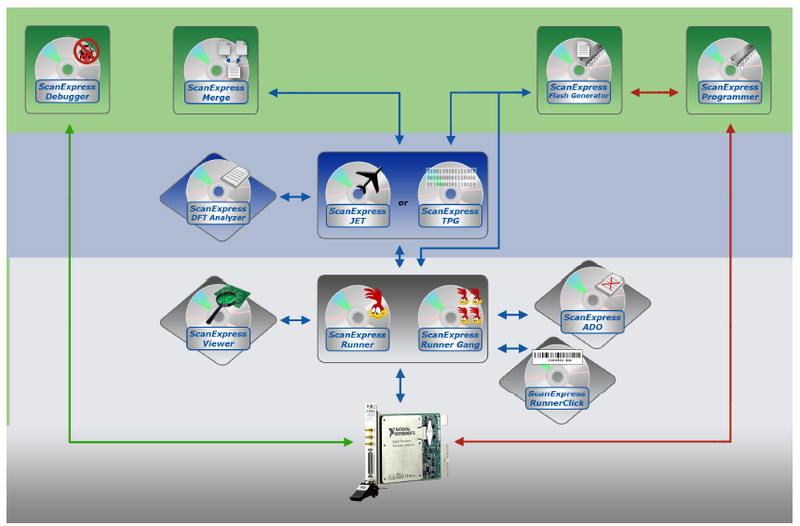 Easy Integration with National Instruments LabWindows/CVI, LabVIEW, and TestStand platforms. The ScanExpress family of boundary-scan tools offers a fully integrated development environment that includes automatic boundary-scan and at-speed functional test program generation, test program execution with advanced pinlevel diagnostics, interactive boundary-scan debugging, and In-System Programming (ISP) of devices such as Flash memories, Serial EEPROMs, CPLDs, and FPGAs. The ScanExpress applications are modularized allowing the creation of custom tailored solutions for any user. From full development stations and production-only test stations to field service programming stations, flexible feature sets are available to suit any company’s individual requirements. Execution based ScanExpress applications such as ScanExpress Runner offer a direct graphical user interface (GUI) to select the PXI/PCI/PXIe-655x series HSDIO instruments as a JTAG controller. Also, ScanExpress software applications fully integrate with popular National Instruments LabWindows/ CVI, LabVIEW, and TestStand platforms through an easy-to-use, high-performance DLL interface. Managing boundary-scan structural and functional testing with National Instruments software driven test systems has never been easier. And because Corelis’ boundary-scan software is compatible with Microsoft Microsoft Windows 7, Windows 8/8.1 and Windows 10 operating systems, installation on a NI chassis with a Windows-based embedded controller is a snap. Turn your existing NI chassis and HDSIO cards into a complete boundary-scan test system. Interface with low voltage JTAG systems, without the need for additional circuitry. Get a higher return on your investment by integrating JTAG structural and functional tests with existing digital I/O tests. Add JTAG functionality to an already modular hardware platform. Compatible with the robust ScanExpress boundary-scan development platform to reduce test development time and cost. Reuse of hardware means more familiarity, reduced setup times, and shorter learning curves. Peace of mind aligning with a reliable National Instruments Alliance Partner.